Giving Hope Lawn Management is proud to serve the community of Glen Allen with professional lawn care and landscaping services. For more information or to get a free quote call us today at 804-839-8340. The community of Glen Allen, VA, is consistently considered a top place to live. But that doesn’t always mean finding the maintenance solutions that your home requires. 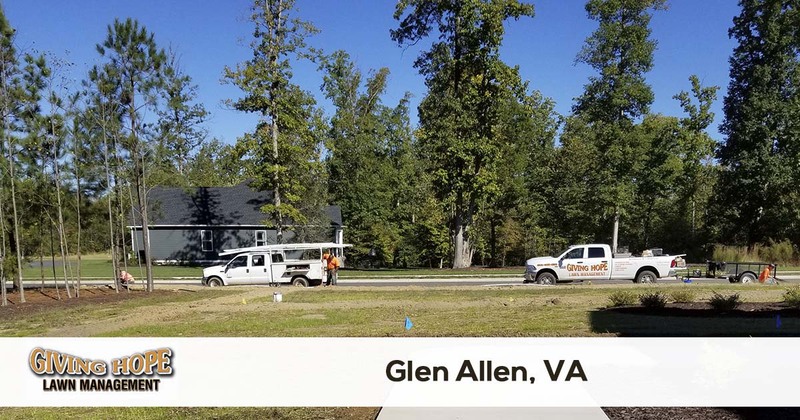 Whether you’re an area resident or you operate a local business, it seems as if Glen Allen lawn care is always out of reach. Whether a landscaping company limits your service choices or they just charge too much, it makes keeping your curb appeal up a challenge! Instead, you can save a ton of cash and frustration by choosing the reliable option in local landscaping services. More people know that Giving Hope Lawn Management remains the trusted name in lawn services! Call today to learn how we can save you more on your best landscaping options. No one cares for your lawns like our team! Many companies refuse to offer extensive lawn care options because they’re worried about the expense. But our landscapers never shies away from a challenge! Whether you are concerned with your plants’ overall wellbeing, or you have a question about your irrigation systems, we always have an affordable solution for you. Stop worrying about how much your repair will cost and save more with us! We can assist you with all your landscaping services. Whether you need dependable monthly lawn mowing or even finish grading for a new property, we do it all! No one else achieves the level of quality we do, nor do they offer the affordable pricing that we can provide. When you deserve the best landscaping services around, you need us to assist you! For the best in reliable and affordable landscaping solutions, our team remains just a phone call away. Hire us now for all your lawns and experience the difference we make! Giving Hope Lawn Management is the industry leader for lawn care and landscaping in Glen Allen. We offer a 100% satisfaction guarantee with all of our services, so there is no risk for you to give us a try. Give us a call today for the fastest service at 804-839-8340.